Why are some models not included in my web publication? You are here: Home > FAQs > Why are some models not included in my web publication? 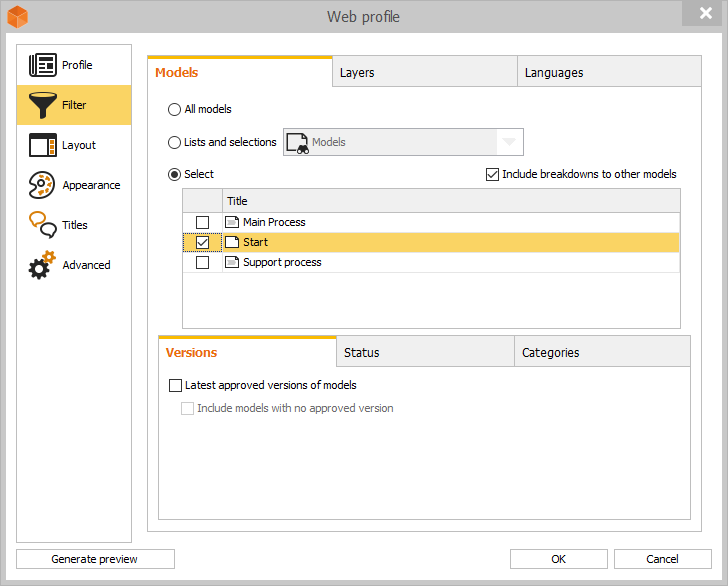 This can be due to different reasons, but a common explanation is that models are filtered because of a selection of models in the web profile. Edit the web profile by selecting “Tools – Publish” in the menu and then the pen icon. Select “Filter- Models”. The option “All models” will include all models in the web publication. You can also make a selection of models by using the option “Select”. If you want to include breakdown models from your selection you need to check “Include breakdowns to other models”. Are you publishing the correct language? Are you publishing only the latest approved versions of models? If yes, are your models approved? Are you publishing only models with a specific status? If yes, do your models have the correct status? Are you publishing only models with a specific category? If yes, do your models have the correct category? Are you publishing to the correct location?